Many people don’t realize the vast choices of garage door hinges available in the market until they find theirs are faulty need replacements. Most people are simply looking for an exact replacement, however, this may not be the best solution. Their hinges may have failed because they were not the most optimal option. It'd be worth your while to see if some other variety is better suited for your door. 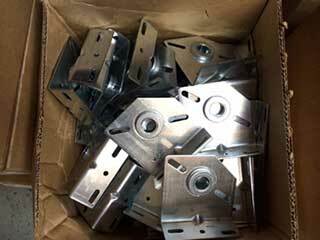 Hinges are available in a number of different materials including various types of metal, aluminum, and even plastic. Steel ones are more durable but are also susceptible to rust. Aluminum ones won't rust, but will damage easily and won't be able to support heavier doors. As for the plastic ones, they are actually made from fiberglass reinforced with nylon, and they're known for their smooth operation. Worn out hinges can make the rollers operate crookedly, which puts needless strain on the system, and may even cause the track to be damaged, which will prevent the smooth operation of the door, and possibly cause its panels to slide off. When one hinge gets old or worn out, many people think simply replacing that one particular component is enough. This is not the best practice. You should have all the hinges on both sides replaced when that happens. Doing this will ensure that the operation of your door is not compromised and may even save you time and money in the future, as the likelihood is that if one hinge wore out, the others are soon to follow, and the potential dangers that can result from them breaking aren't worth the risk. There are a few different types of garage door hinges. From simple, squeak prone ones that are unlikely to last very long, to ones that provide better insulation and offer smooth and silent operation, as well as durability. Ideally, you'll want a low gauge hinge, as that implies a thicker grade of material, which will provide a stronger foundation for your garage door system. It is worth keeping a couple of extra hinges in your home as spares just in case one or more are compromised. As is the case with any aspect of garage door maintenance, if you are unsure of what to do, you should consult a specialist. Never try to replace your system's hinges by yourself. Since they are closely involved in the door's operation, this type of dangerous procedure should only be performed by experienced technicians. Our experts at Garage Door Repair Bronx have the skills, experience and tools to correct any issues quickly and safely. Don't risk an injury, call us today.